I hope you all had a great Thanksgiving break. I've been eating all the leftover stuffing & pie and have been packaging orders like a crazy person so THANK YOU to everyone that purchased & supported my shop this year. You continue to bless me more than you can ever know. The shop is closed for the rest of the year but you can now find some of my prints over at Maker + Ink. 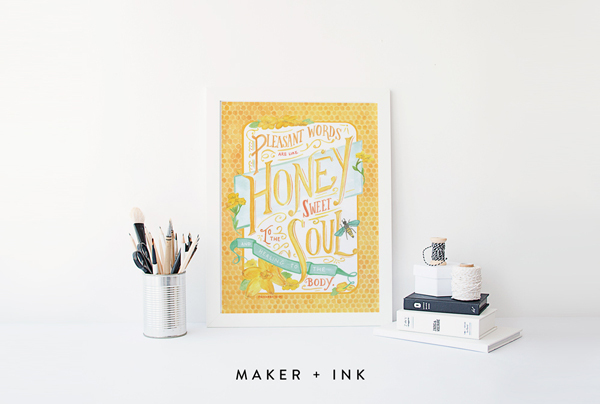 At Maker + Ink, our passion is creating art that declares God's truth and looks great in our homes. We are excited to offer a curated collection of modern, stylish, faith-based art prints created by a small group of talented designers from across the country. Instead of clicking from website to website in search of the perfect scripture print, you'll find a carefully selected assortment of designs all in one place." AND, it's about to be December! (where did the year go!?) Do you know what that means? A new month for the sketch-a-day challenge I started back in October! For the month of December my friend, Lindsay, owner/painter/letterer/artist behind pen + paint will be leading hosting the challenge! You can see the daily prompts on her blog. I am so excited to draw with her and I hope you join in. Since we're talking about sketching, I frequently get asked what my favorite tools are for the job so I'm sharing some of my most used basic supplies. Click on any image for source. For drawing: pencils, pens and markers. Basic #2 pencil is pretty much all I ever use. My pen collection, on the other hand, is quite extensive but these Faber-Castell Pitt and Pilot G-Tec-C are my current favorites. The Pitt are waterproof and come in different sizes and the G-Tec makes a super fine line. For painting: watercolors and watercolor paper. I've used Prang in the past but I recently invested in this travel set of watercolors and am really pleased with them. There isn't black in the set so I just use my calligraphy ink to darken when needed. And watercolor paper. They key here is the weight. Make sure you get 140lb so the paper won't ripple. For a sketchbook, I like 5.5x8.5 hardbound with band to keep it closed and I like the smaller size so I can fit it in my bag. And for notebooks, I prefer dot grid books like this northbooks set I found on amazon. That's it for my favorite basic supplies. For a more detailed list of all my favorite design-related things, go to my design faqs page. Now, grab a pencil and some paper and get sketching with us!